This incredibly zesty dressing is perfect for green beans as well as lots of other vegetables. These measurements will yield about twice as much as you’ll need for one meal so you’ll have a chance to try it on something else this week. Remove the ends of your beans and cut to the desired length before steaming or blanching for a few minutes. Remove from the heat and immediately run them under some cold water until cool all the way through. Drain and finely chop a full tin of anchovies, or a couple teaspoons of anchovy paste, then stir together with two tablespoons of Dijon mustard and a handful of chopped parsley. Whisk in a cup of extra virgin olive oil followed by a cup of freshly grated parmesan, salt and pepper to taste. 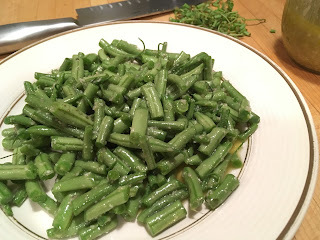 Toss with your green beans well before serving.